One might claim that Chicago-based sculptor Diane Simpson creates “house images.” Her three-dimensional forms, at once poetic and quirky, are translated from the artist’s personal archive of found images, their sources ranging from details of architectural ornamentation—whether an Art Deco wall sconce or vintage wallpaper—to articles of clothing. Distilled either from the artist’s memory or from photographs found in books as diverse as an encyclopedia of Elizabethan dress and a 1920s advertising pamphlet from Marshall Fields, Simpson transforms her images into architectonic sculptures that at once transcend their historical and quotidian sources yet deliver us anew to the realm of the everyday. This transformation occurs through precise acts of drawing and construction, in which the artist, sparked by the flounce of a skirt, the triangular fold of a collar, or the domed crown of a bowler hat, renders her inspirational garments as two-dimensional shapes onto vellum graph paper. The resultant sketch serves as a blueprint—much like a garment pattern—for the final sculpture, whose monumental form, both ironic and emblematic, retains the bold lines and foreshortened perspective of the original drawing. The surfaces of the final works, stained with oils and acrylics, or embellished with delicate hand drawn geometric patterns in graphite or crayon, deliver Simpson’s sculptural forms back to the realm of drawing. Both the work and the viewer are caught within a subtle warp of spatial dislocation, whereby two dimensions unfurl into three, and three dimensions fold into flatness. 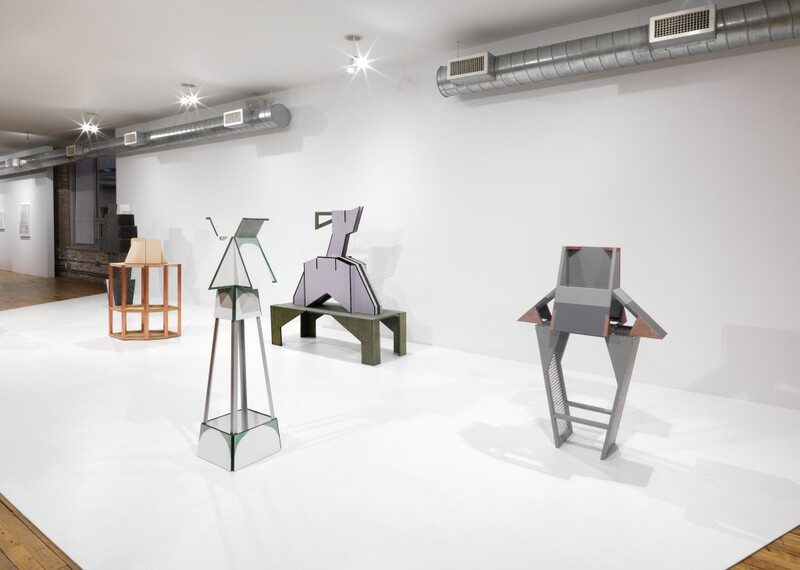 These material experiments eventually led to her breakthrough series Samurai (1981–83), first shown at Phyllis Kind (1983) and recently on view at JTT Gallery, New York (November 13, 2016–January 15, 2017), one of three galleries that currently represent the artist.4 Haunted by the memory of a scene from Akira Kurosawa’s epic film Kagemusha (1980), in particular the armor worn by samurai during a ceremonial gathering, Simpson abstracted the cascading arcs and linear folds of the warriors’ skirts into free-form structures. Constructed from panels of MDF (medium density fiberboard) that are slotted together— as if a puzzle, rather than fastened or glued— they exude the stately presence of their titular sources, while emphasizing the planar geometry of the costumes’ segmented plates. With the Samurai series, Simpson began her ongoing fascination with the clothing forms that have been central to her now nearly forty-year practice, as well as her continued translations of traditional Asian garments and Eastern aesthetics. In Formal Wear (1998), for example, two oversized kimono sleeves constructed in layers of black polyester are suspended at right angles by a thin poplar support attached to the wall. Part of an early suite devoted to sleeves, whose subtitles (cradle, sling, pod) suggest vessels for healing and nurturing, the work evokes, despite its spare elegance, a bodily presence that inhabits all of the artist’s work. Simpson mainly works in series, whose subjects have included hats and headgear, aprons, cover-ups (bibs, collars, vests), and courtly vestments (capes, robes, pantaloons). Her interest in producing multiple related forms shares an affinity with Minimalist seriality, as does the artist’s concern for geometry, symmetry, and exaggerated scale. However, her referential abstraction also revives the feminist concerns of Post-Minimalism, embracing the lived experiences of women and family, alongside the manual processes of applied arts and crafts. To this end, Simpson fabricates her structures by hand, using pliable materials, including, in addition to corrugated cardboard and MDF, canvas, plastic, and linen, the characteristics of which closely simulate the tensile properties of her domestic sources. Yet, the final sculptures are realized as hard structures—with aluminum, plywood, and brass sometimes integrated as both aesthetic elements and supports—exposed armatures or scaffoldings that reveal the architecture of their own construction. Poet Lisa Robertson includes scaffolding in her ontology of “soft architecture,” as a “soft arcade” of clothing, furniture, fabrics and textures that shapes our everyday environment. “Scaffolding is a furnishing insofar as it supports the desires of our bodies,” writes Robertson. 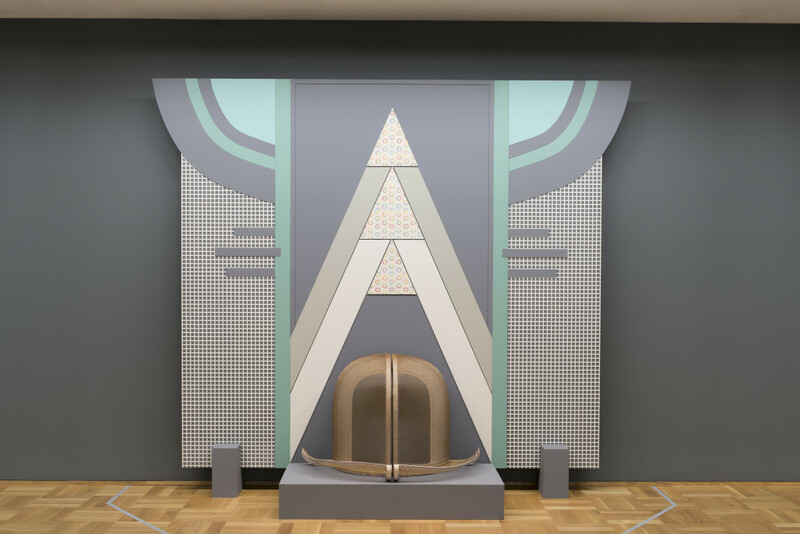 Simpson’s sculptures, with their totemic forms, suggest costumes, coverings, or containers for the viewer’s body—the audience animates the work with their own memories and desires. 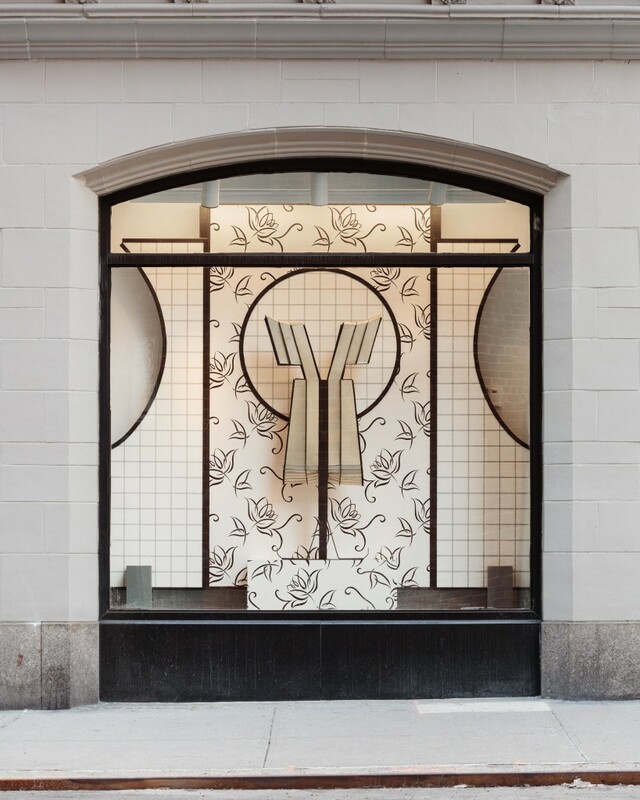 Simpson has extended her investigations of material culture and vernacular architecture into large-scale environments that integrate her clothing forms with backdrops inspired by Art Deco store-window displays. Window Dressing, first created in 2007 for the street-level windows of the Racine Art Museum, Racine, Wisconsin, then re-installed in 2014 for New York University’s Broadway Window gallery, celebrates the artistry and labor of the window dresser, while reframing her narratives on fashion and display within the public realm. 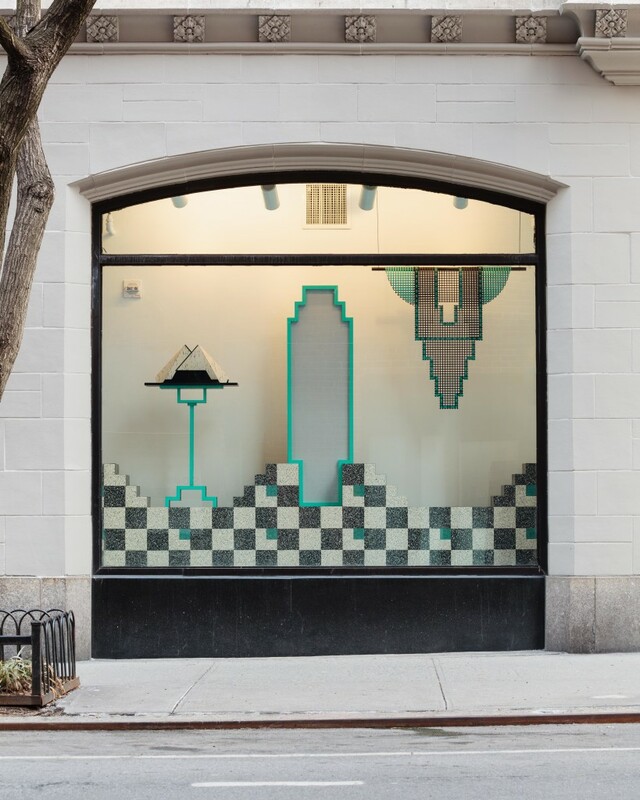 These installational tableaux have informed Simpson’s new body of work based on window valances, combined with found architectural elements, such as tin cornices, and forms abstracted from frilled skirts or peplums—the latter the subject of her most recent series on view at Corbett vs. Dempsey in Chicago last fall. Still in progress—the artist admits she works slowly— the new work will form the foundation for an upcoming solo exhibition at Herald St gallery, London, in 2018. These exhibitions come in the midst of much renewed attention to and discovery of her work, particularly the issues of materiality and craft that have been at the heart of her practice for four decades. “I find all of the attention very exciting, wonderful, and scary,” says Simpson. “I am not sure exactly where I am going, but that kind of excites me. ” It is a challenge, and the process of trial-and-error, that the artist is eager to meet. Gaston Bachelard, The Poetics of Space (Boston: Beacon Press, reprint 1974), p. 6. As stated to the author during a studio visit on February 24, 2017. From an interview with Dan Byers in Diane Simpson (Boston: Institute of Contemporary Art, 2015), p. 53. 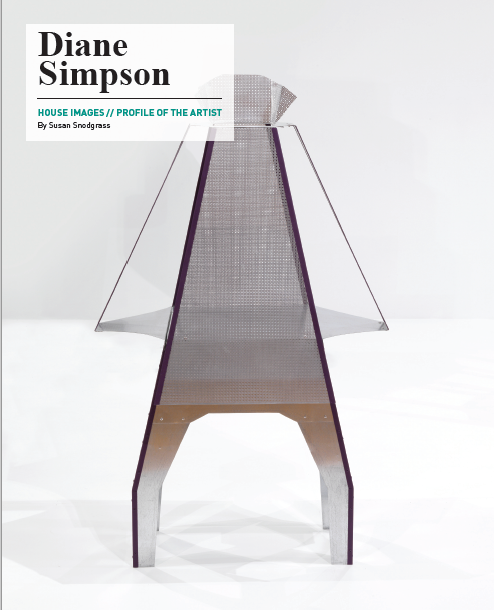 Simpson is represented by Corbett vs. Dempsey, Chicago; JTT, New York; and Herald St, London. [6 As stated to the author during a studio visit on February 24, 2017. May 23, 2017 | Filed under Art Seen: National, PAST ISSUES and tagged with Corbett vs. Dempsey, Diane Simpson, JTT, Susan Snodgrass, The Seen.